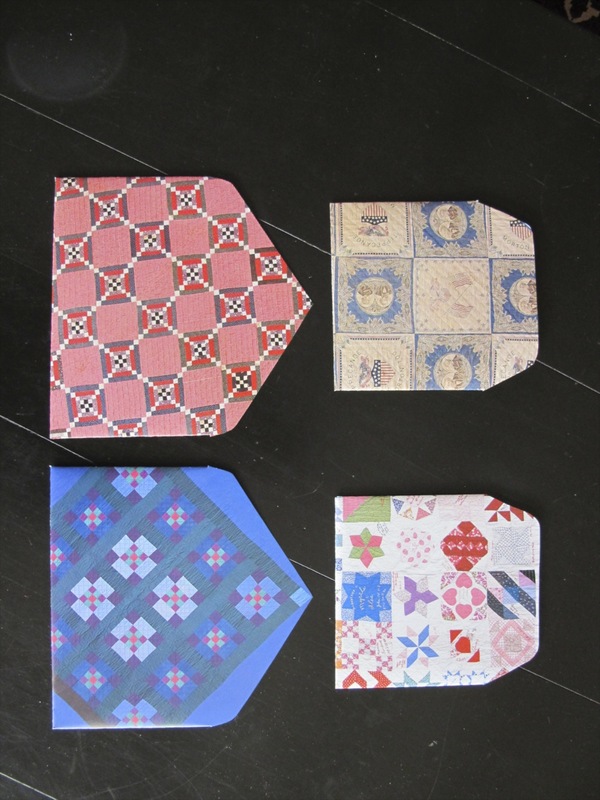 While exploring the internet, I came across some hand-made envelopes, ones made from recycled paper from magazines, books, advertising flyers etc. 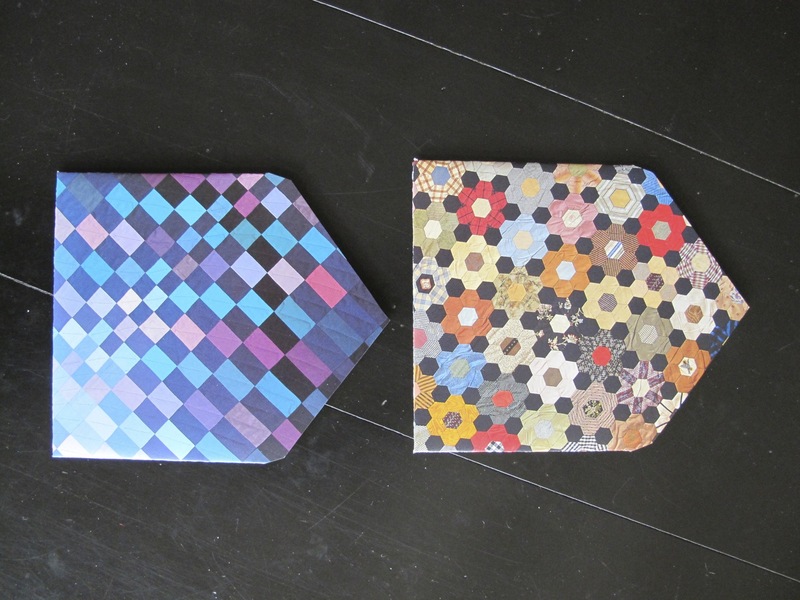 I was rather intrigued and wondered if they would be a good match for my hand printed cards. 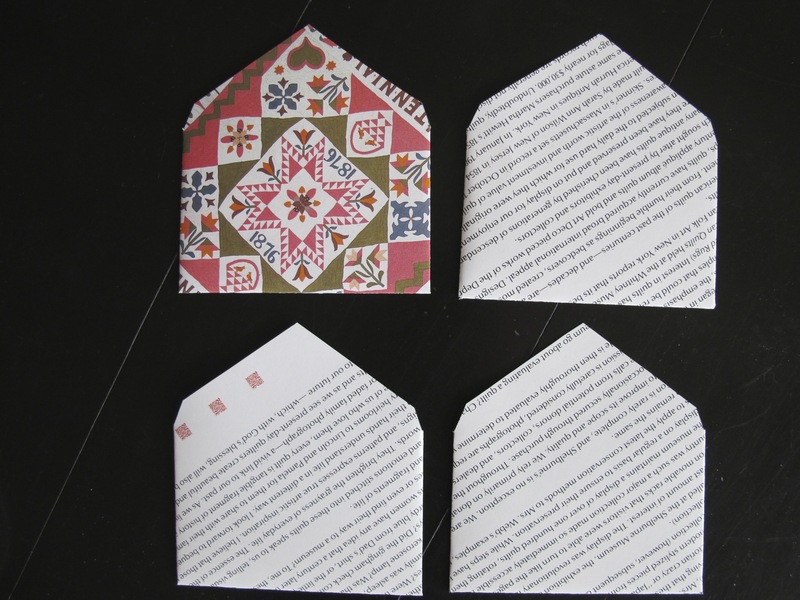 I searched books and found a used instructional book that contained templates – just so I could see if there was any trick to making these wonderful envelopes. No, no tricks involved. 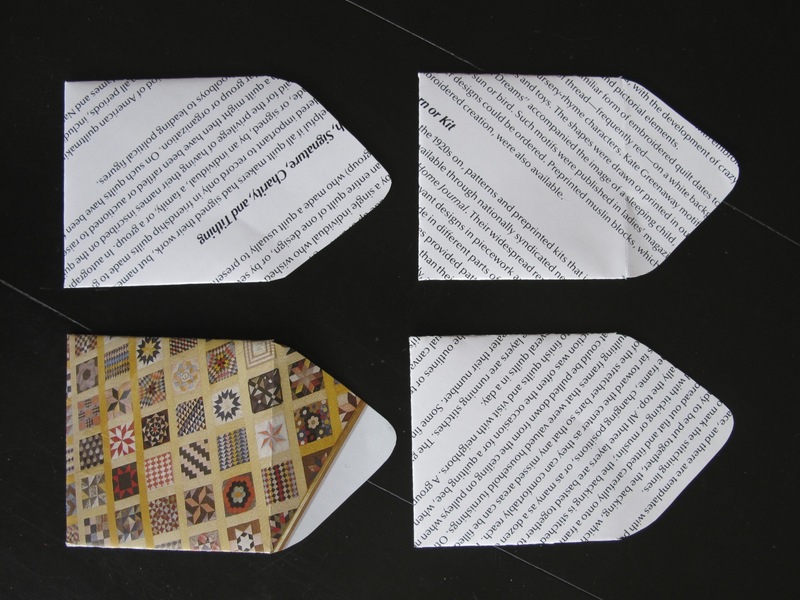 You can make your own templates by taking apart any envelope you’d like to duplicate. Just work carefully, lay it out flat and trace the outline to make your pattern. There are an amazing number of variations in envelope patterns and sizes, but they all produce a similar product. Some patterns make better use of an 8 1/2″ x 11″ piece of paper, but that seems to be the major difference. When looking for paper to use, I thought about what wonderful paper you find in some books. 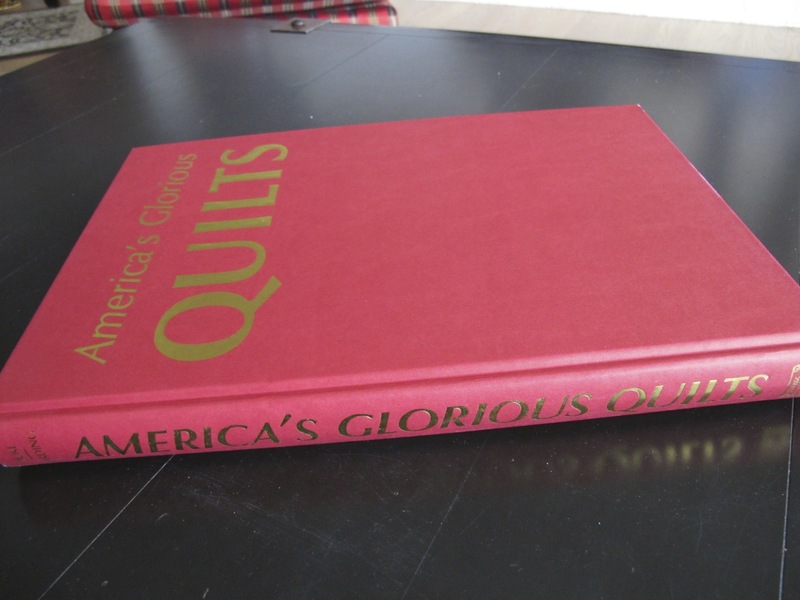 I found an old quilt book – one that I have not even been able to unload at a used book store. I decided if anyone was going to cut this book apart to use for a craft, it might as well be me. Cutting the first page out of the book was the hardest part. I was brought up with a HUGE respect for books, and I felt like I was committing a heinous crime. Of course, once I realized I’d ruined the book, it became much easier to continue. And continue I did. I carefully sliced out every page. 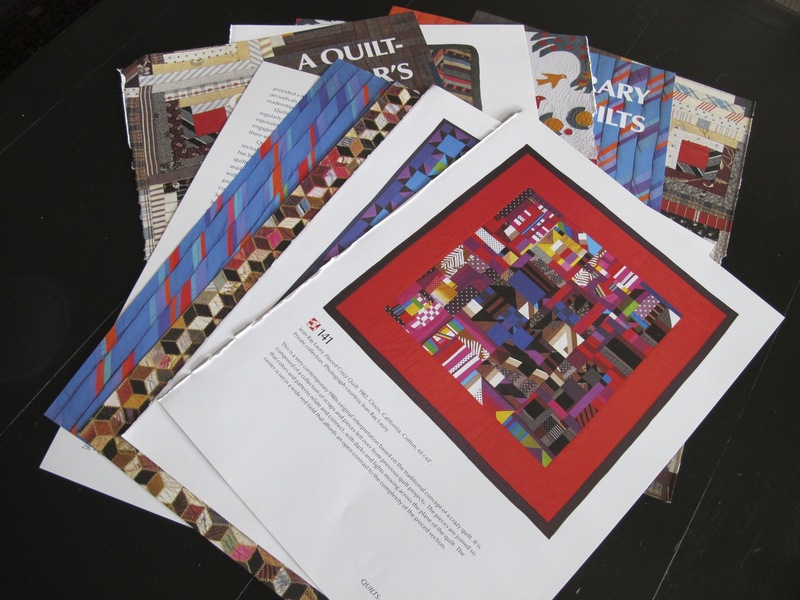 I then selected my favorite colorful images and matched them with envelope templates that made best use of the design. 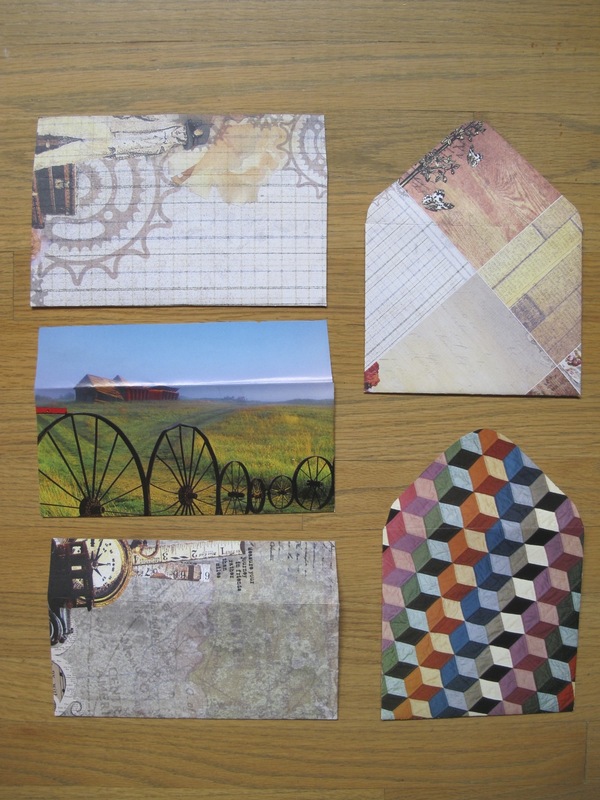 Then I used quilt pictures that I didn’t like, since they still made pretty decent envelopes. When I was left with just pages of text, I decided that they would make excellent envelopes as well, as the paper quality was far too good to waste! 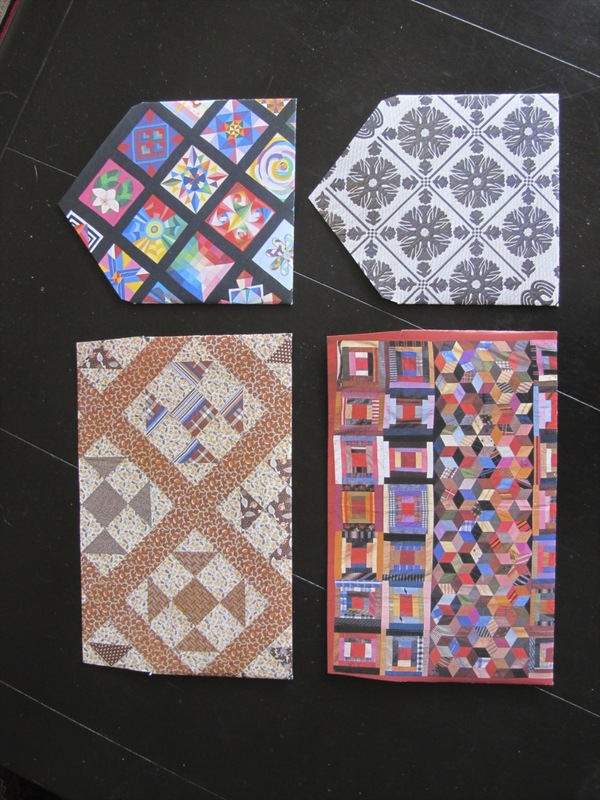 I’ve made some lovely envelopes out of old calendar pages (I knew I was saving those for something.) I’ve also used magazines and scrapbook paper. 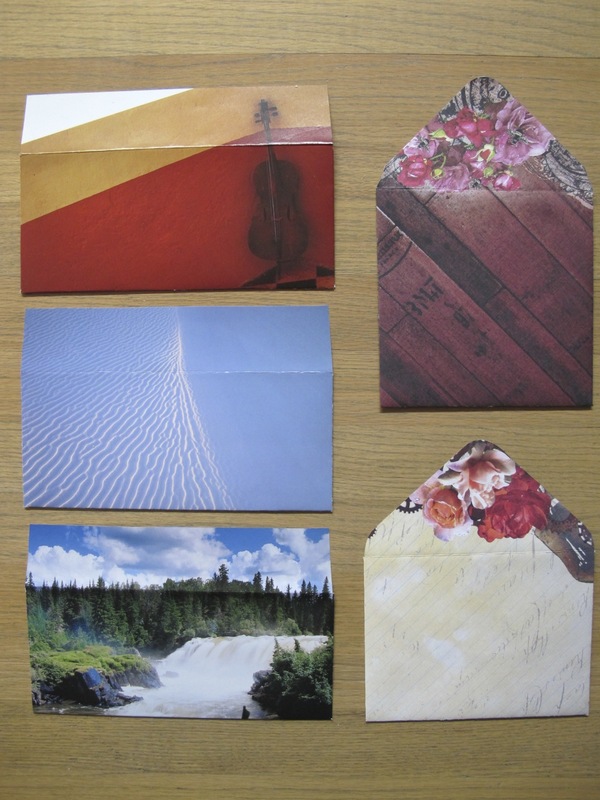 Some scrapbook paper is printed on 2 sides so the inside of the envelope is also very attractive. All very interesting! I’ve closed the envelopes with a glue stick, and for mailing I add white stickers to create space to write the address. This isn’t necessary when you are going to hand deliver. The best template material I’ve found is at a dollar store – inexpensive flexible plastic cutting boards work very well. They’re easy to draw on, easy to cut with scissors and thick enough to trace around easily. I will go almost anywhere in search of great supplies! 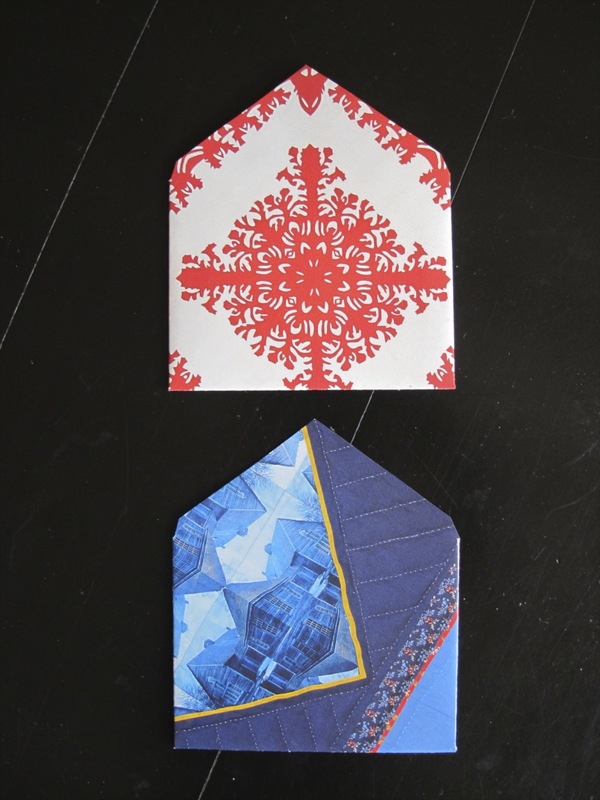 I opened the flap on all the envelopes so you could see the different designs and shapes. As you can see, there is no end to the fun possibilities with this technique. Very unique and unusual – might have to give this a go! Please do – it is such fun and super easy – really! Thanks. I’m hoping the extra postage thing only applies to square envelopes. Most of the rest are standard size envelopes – they just don’t look standard! They look amazing Terri, the possibilities are endless. So much fun to watch them take shape. 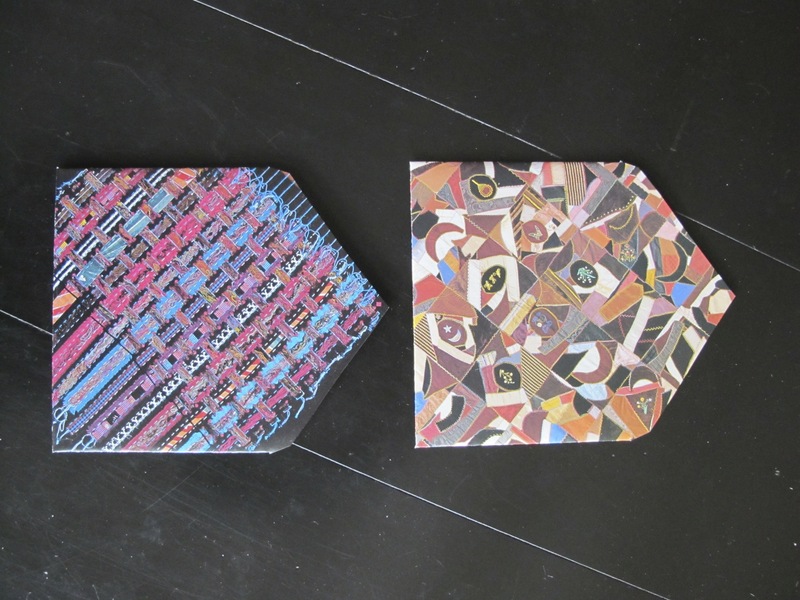 I can appreciate that there would be an addictive quality to this project…. Thanks, Catherine. You know how I love this mindless kind of activity. Oh, and wouldn’t they be great in foreign language magazine pages? This is so fun.. and so doable! I love the one with the cello (or is it a violin). I’d love to try this.. maybe with some old sheets of music..
Old music would be great. Honestly you start to look at all paper with an eye to how it would look as an envelope! Thanks. And it is sick the way I am now eyeing good quality paper – any where that I see it! As though I don’t have enough around the house to work with… It’s a curse I tell you. I appreciate your comment and I hope your mom would approve. Oh, one more thing…in the US envelopes that are square are considered “non-standard” and require 65cents postage. WOW Terri! Those envelopes are Outstanding!! I think you’re (as usual) on the cutting edge of a new trend. These are beautiful!! (I would have thought the postal service may have an issue with such decorated envelopes, but I guess not.) Great idea; I’ll have to borrow it for MY handmade cards! Thank you. I expect that as long as the address is easy to read, there shouldn’t be a problem. 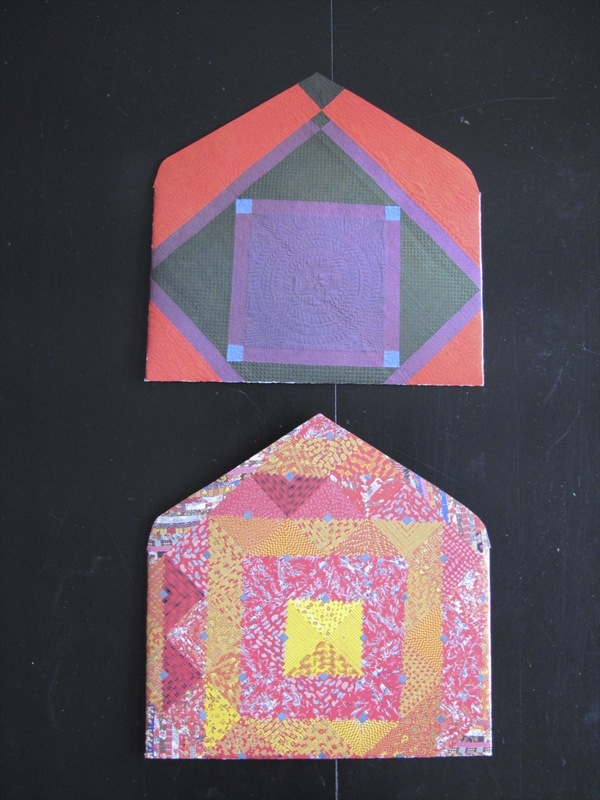 A lot of “mail art” includes very elaborate envelopes so these should work. I just mailed a cheque in one and am anxiously awaiting confirmation that it has arrived! Notice I didn’t mention the book that I bought, because of course anyone with half a brain could figure this out – once you’ve gotten the idea, right? They are absolutely addictive so be careful!